This entry was posted on August 9, 2013 at 11:00 pm and is filed under Action, Drama, Science Fiction with tags 2013. You can follow any responses to this entry through the RSS 2.0 feed. You can leave a response, or trackback from your own site. Nice review Mark, interesting take. I enjoyed this one, but District 9 is a better film. I enjoyed parts but pretty mediocre overall. For an action filled sci-fi, I’d say Pacific Rim entertains so much more. I wasn’t truly a fan of District 9, so I won’t go jumping for this. Good review. I looked up your old review. I suppose your B- is a very mild recommendation. 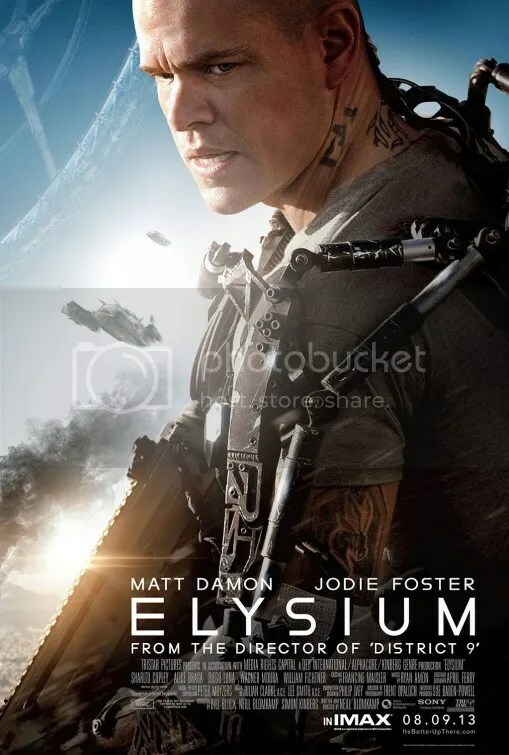 However, I can’t imagine anyone rating Elysium higher than District 9 unless you’re a huge Matt Damon fan. I’ve seen 12 of Matt Damon films, last I checked. Although I don’t think I’ve seen any of his recently, I’d say I’m a pretty big fan. Good review Mark. The look and feel of this movie is what really works. The script could have been better and at least a bit more subtle with what it’s trying to say and get at, but it was better than most sci-fi that comes out nowadays. Sci-fi is definitely in a commercial boom period right now. Last 5 years has seen Star Trek, Avatar, Moon, District 9, Inception, Rise of the Planet of the Apes, Looper, Pacific Rim. Truly a great era for the genre. Still sounds a lot better than some stuff I’ve seen this summer. I’ll be catching it on Tuesday, as I have been sick. Glad you “liked” it, even though it’s no D9. 2.5/5 is not a recommendation. I liked Damon’s performance and the exceptional production design though. Thus the quotation marks lol. And yeah, you used the word extraordinary, so I figured you had to like something about it, even if it was just the special effects. I wanted to love this. Some of the things looked amazing and Matt Damon was very good. But over all I just, liked it. I love Jodie Foster , but her performance was pretty bad. I give it 3 stars. While I was watching I kept thinking Jodie knows what she is doing. There must be some reason her performance is so bad. The movie ended and I was still at a loss. I agree this film was very heavy handed and lacked any true depth outside of Damon’s character but it was entertaining nonetheless. I also believe that Jodie Foster, for better or worse, played her role as written. I’m not sure anyone else would have been more effective. It was a very superficial villain. Yes it was badly written. That’s not her fault But she chose the role as written so she shares some of the blame. The way she played the part was like a cartoon. Plus her accent kept changing – sometimes in the same scene. I’m glad you enjoyed it though. I very much enjoyed Elysium, so I’m disappointed to hear it wasn’t working for you Mark. I was a big fan of District 9 and although I would agree that Elysium isn’t as strong, I wouldn’t say they’re like night and day. There are some areas we agree though. In terms of social critique, Elysium falters because it’s just too busy. Not only is it trying to address more societal problems than it should, but the main narrative (which includes your “stock villains, hackneyed writing and situations that create more questions than answers”) totally distracts from any significant points that it could make. Also I felt that Damon was tremendous in the lead role, giving the viewer a lot from what you assume is a very light character. His portrayal of Max is very nuanced one that is still remarkably sympathetic. I was befuddled by Copley’s character as well and was not sure what to make of him either at points. I concur that Fichtner and Foster were awful and boring. I feel like sometimes Foster likes showing off, quite pretentiously, that she’s fluent in French. It didn’t work at all here. Another gripe I had was Blomkamp’s excessive use of handheld camera. The shaky cam was very distracting from some beautifully rendered environments and technology. Glad you at least liked the effects! Haha. Anyway, well-argued and thoughtful review Mark. You know what? I guess the shaky cam didn’t bother me because I didn’t even notice it. Maybe it’s so common now I’ve just gotten used to it. Exactly. I hated Man of Steel but at least Zod was acting in the interest of his own people so his actions made sense. Foster on the other hand was eliminating her own people for reasons that were largely unclear. When i first saw this trailer in early spring i thought it looked good, but as it drew nearer i just lost interest, so i didn’t go to see it. If I read a lot of strong reviews I would have reconsidered, but i think your review confirms my hesitation. Great review. I agree with a lot that you’ve said. I enjoyed the film well enough, but I had definitely hoped for better. I said similar negative things about Jodie Foster’s character in my review, but I actually loved Sharlto Copley. He can certainly play crazy. Yeah Sharlto wasn’t bad, just weird. I thought Jodie was the focal villain. When everything switched to him in the third act, I was confused. I mean doesn’t he report to her? Wow, we agree w/ a lot of points here Mark! Come to think of it, I think I was too generous w/ my rating. Ah yes a little wit would’ve gone a long way. I almost think they could’ve gone the Starship Troopers route and made this more campy. It would’ve justified the way all the villains acted. It also would’ve made the simplistic good vs. evil storyline seem more acceptable. Oh I haven’t seen Starship Troopers but seems like lots of ppl like that one. I just hate bugs and I know the aliens are bug-like right? Yeah, it seems that Blomkamp wanted it both ways, initially there was a sense of realism which was was pretty compelling but then it just resorted to something too Hollywood-ized and unrealistic. Yeah the aliens are actually called The Bugs. It’s a silly film. Enjoyable in the way Pacific Rim is fun. I agree on many counts Mark. I give it 2 stars. This is shades of a Star Trek episode. The rich in the clouds, the poor in the mines. Why don’t the Earth workers have the health machines? Because lack of them keeps them servants and thry lack Canada’s universal health care system. What will they do when or if the masses have access? What will happen with the overpopulation problem? I liked Matt Damon and even Jodie Foster as a cross tween Al Haig and Maggie Thatcher. Unlike District 9 this sacrificed characterarcs for preachy simpliistic ending. It was even boring. Yes, it was a very cursory examination of a complicated issue. I don’t think I would say I was bored exactly, but I wasn’t really captivated either. Damn! Disappointing review. 😦 But I still really want to see it when it’s out here… Been waiting for this one for ages. I had higher hopes. Reaction has been tepid in the U.S.